Resilience is a wonderful trait to have; it is a joy to watch when your team refuses to lie down. My feeling after the game yesterday was one of pride and slight disappointment that we didn’t leave the Etihad stadium with all three points. This really was the first real test for Arsene Wenger’s team this season and they did not disappoint. Yes, we may have conceded a soft goal but the thing that sets this Arsenal team apart from some of the past is the refusal to be ruffled by it, we did not lose our shape rushing forward for an equalizer only to succumb to the dreaded breakaway counter attack goal. No, we kept playing our game and got our just rewards from Laurent Koscielny’s equaliser. This is a different arsenal, an arsenal full of confidence which as the away team outplayed Manchester City for the majority of the match. To say the goal we conceded came against the run of play would be an understatement. We were playing some beautiful football and but for some profligate composure in attacking situations we should really have been in front long before we conceded. Plaudits could be spread throughout the team for their performances as we stood up to the big test in front of us and dare I say it showcased our potential to contest for domestic honours. In the lead up to the game rumours filtered through that our skipper could potentially be absent from the squad. That was confirmed when the team was announced and Vermaelen was nowhere to be seen. It was revealed that he had not travelled with the squad due to Flu. Not the most confidence inducing news to hear, the loss of our skipper is a big miss in any game however given the strength of our squad his replacement Koscielny is quality enough to fill the gap. The change in the centre back position was a forced change but Arsene had a surprise up his sleeve when he chose Aaron Ramsey to occupy one of the front three positions ahead of Oxlade-Chamberlain and Walcott. You could hear the grumbles across the country when that news came out. Aaron is still working on repairing his reputation which was slightly tarnished last season due to some mixed performances. The jury is still out in some Arsenal fans eyes however yesterday the Welshman produced one of his best performances in an Arsenal shirt to reassure fans of what he brings to the arsenal midfield. He may not have the box of tricks of skill of the Ox or the raw pace of Theo but what he does bring is quality on the ball, quality in the pass and excellent ball retention. This was a characteristic that was definitely required against Man city to ensure our control of the game and Arsene deserves praise for taking such a bold step. One of the potential negatives from the game was the disappearance of Gervinho’s shooting boots. He definitely had the lion’s share of attempts for us in the game but nothing came off for him. In some people’s eyes it may seem the same old same old with the Ivorian. However I could see a difference in the forwards play and attitude. Yes he missed chances but the Gervinho of old would not have even attempted to make some of the shots he tried. Clearly buoyed by his recent rich vein of goal scoring form he was clearly more direct in his play and seemed hungry to get on the score sheet. It didn’t come off for him yesterday on another day he’s scoring goals like he did last week against Southampton. I encourage the new hungry Gervinho, although it was a source of frustration for Arsenal fans yesterday I feel if he keeps at it his the confidence will continue to grow and those chances will be converted more often. 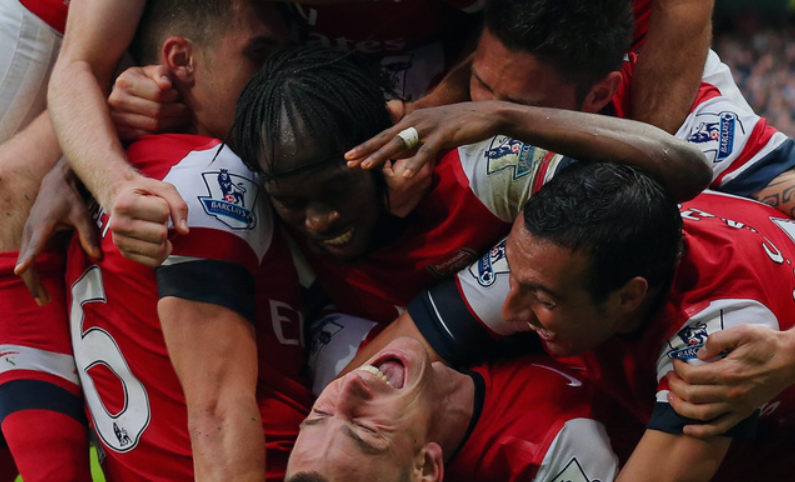 Apart from that I cannot defend that shocking piece of control by Gervinho when put through by Ramsey. Seriously he showed the kind of touch I have only experienced when playing pro evolution or FIFA and the ball is played on to a player with a rating lower than 50, 40 even. I’m sure the manager will keep working on his finishing in training but again I believe with growing confidence it will improve. At the back the Steve Bould factor was again evident as the whole back four put in a great defensive performance, they were protected well by Arteta and the rest of the midfield but held their own when called upon. I lost count of the number of interceptions on potentially dangerous through balls; in the past those kinds of balls were getting through. Per Mertesacker has come on leaps and bounds this season and is now receiving the plaudits from the press who were so quick to write him off last season. The fact he was voted man of the match says it all, the big German has really shown he has what it takes at premiership level and shown up all those who seem to think defending is all about pace. 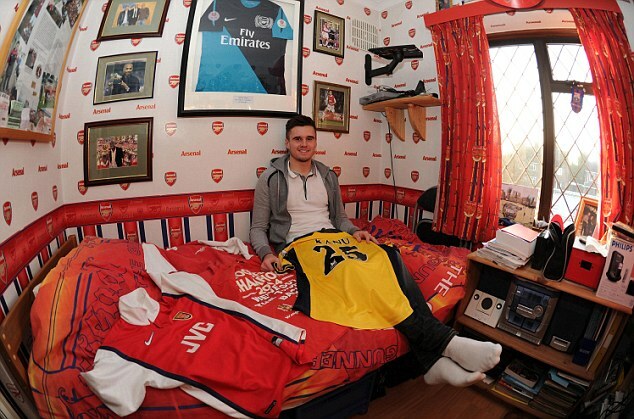 Another player who seems to be showing improvement from last season is Carl Jenkinson. This young guy as we know is arsenal through and through which is always a nice trait to have in a player. Though being a super fan isn’t the only requirement to play for arsenal, you need the quality to become a regular. Although the unfortunate injury to Bacary Sagna has elevated Carl to first team duty he has taken his opportunity with both hands and he is doing enough to prove he deserves to be starting for Arsenal. What we forget is when Jenkinson came into the team last season we were in complete turmoil because of the departures of some big players; He had to hit the ground running despite the lack of experience at the top level. The past season clearly allowed the defender to learn and work on his weaknesses. He almost seems a completely different player but this is just testament to a growing confidence in the player, no turmoil in preparation for this season and now feeling part of the set up. Much like Gervinho and Mertesacker his confidence has grown this season due to learning from last and it is clear to see. Whereas last season I may have questioned his longevity as an arsenal player of the future I can now see the signs that he has potential to become an important player for us. Still plenty for him to learn and Sagna still owns the right back position but Jenkinson is definitely doing his chances no harm. Overall it was a great performance all round, even excusing Vito Mannone’s flap at the corner in which we conceded the goal; he pulled off some important saves to make up for the misjudgment. Our midfield were as majestic as ever and overshadowed the likes of Yaya Toure and David Silva. The Arsenal post Robin Van Persie have announced themselves and intend to play a huge part in the premiership this year. So the Ox will be released on Saturday against the Belgians. Roy Hodgson has revealed that he will give starting opportunities to both Danny Wellbeck and Alex Oxlade-Chamberlain in England’s final warm up game before Euro 2012 kicks off next week. A proud moment for all gunners fans to see the young midfielder start for his country at Wembley. Being so adaptable it will be interesting to see where Hodgson will deploy the midfielder in the team. For the England u-21’s Alex was used more as a right-winger, he fulfilled that role to great success often leaving the left back in his wake. He would also drift inside and contribute to teams build up if service was not getting to him on the right; a useful attribute to have as long as the player doesn’t try to do everything. Don’t get me wrong not every game for the u-21 was a man of the match performance, his reputation was such at that level that teams would double up on him to nullify his threat. At Arsenal last season he was used mainly on the left of the front three to great effect, his earlier games were on the right but his adaptability was so that he was comfortable on either wing. Not forgetting his stand out performance in the middle of the park against AC Milan young Alex has proved his usefulness in a number of positions and was probably the main reason he was included in the final 23 England squad. This will have been such an amazing 12 months for the young midfielder, from playing his part in securing promotion to the championship with Southampton to sealing his move to the Arsenal. The Ox’s transfer slipped under the radar of most if not all gunners fans. Given the turmoil of the uncertainty of the futures of Samir Nasri and Cesc Fabregas the signing of a youngster from league one was not exactly going to appease the Arsenal faithful. At the time we wanted to strengthen our squad with replacements of equal stature of the players we were losing not potential. The Ox was an unknown entity and Arsenal fans would never have envisaged the impact he would make in that coming season culminating in an inclusion into the Euro 2012 squad. The game that for me that put Alex on the map was the Carling cup game against Shrewsbury. It was a chance for many gunners fans to see this kid in the flesh at the emirates. Although he understandably had a nervous start to the game he eventually grew and grew in confidence. Again after initially starting on the right hand side he often drifted into the middle and dictated the game when on the ball. It was an exciting performance from the Ox and he ended the game with a goal and man of the match performance. All us fans could talk about leaving the stadium after the game was how good the Ox was, Arsene had found another gem. With gunners fans won over after that game Oxlade-Chamberlain really introduced himself to the nation with his performances against both Manchester clubs. This time he received the exposure as these games were televised for all to see. First up was the Carling cup game against Manchester city; where he was a constant threat to the team and was able to prove himself against top class premiership opposition. Although we lost the game young Ox came out with a lot of credit. His game against Manchester united in the premier league fixture at the emirates really put him in the limelight. Although the game was marred by the controversy of his substitution for Andrei Arshavin the Ox had done enough in the game including an assist for Robin Van Persie to show nationally he was a special talent. It was from this game where Arsene Wenger decided to protect the young midfielder from the added exposure and increased expectancy. At a time when we were going though a bad patch and we probably needed the Ox in the team more regularly Wenger took the decision to quell the pressure on the youngster by carefully selecting his appearances in the team. Something a bit harder for Arsenal fans to understand at the time but on reflection at the end of the season we would agree was the right choice to make. We have already experienced the exponential increase in pressure on Theo Walcott when he was signed and thrust into the England set up. Every game he played was met with high expectancy and led to many frustrated fans when he hadn’t skinned the whole team and scored a hat trick. I think Wenger has used the experiences with handling Walcott to ensure similar pressure is not experienced by Alex. The worrying thing about Alex involvement with England is the increased chances that he will be relied upon in the aftermath of the injuries to Gareth Barry and Frank Lampard. Barry wasn’t replaced with a midfielder when he withdrew from the squad and Lampard’s replacement is Jordan Henderson who has hardly set the world alight this season for Liverpool. We saw at the last world cup what an effect a poor campaign can have on England players and it’s hoped if that is the case the press take into account the Ox’s age. Alternatively a good campaign and performances for young Alex could catapult him into uncomfortable messiah like status. A good campaign could certainly be a big boost for the coming season, the experience of high-profile games in large tournaments could push Oxlade-Chamberlain’s development to the next stage. One thing the Ox has shown is he is a level-headed young man, has a good family unit around him and has the focus to take the opportunities made available to him to carve out a successful career. It all starts from today really, enjoy your game Alex and take it in your stride. No pressure….